Sergio "Maravilla" Martinez (46-2-2, 25 KO's) scored a sensational one-punch, 2nd round knockout against Paul "The Punisher" Williams (39-2, 27 KO's) at Boardwalk Hall in Atlantic City, N.J. With the victory, Martinez retained his WBC Middleweight title. Official time was 1:10. Martinez, 35, used his first-class ring generalship to avoid Williams' brief attack in round one. Williams came out swinging, but did not land more cleaner punches in the round than Martinez. Martinez was able to get inside of Williams' 82-inch frame to connect with multiple straight left hands. Williams, 29, took Martinez' shots well, however, Martinez' left hands proved to be a sign of what was to come. While Williams came out aggressive again to open the 2nd round, Martinez continued to counter Williams' aggression with his own. Martinez showed no fear, and would lets his hands go quickly every time he was within range. Besides Williams 82-inch reach advantage, he stands at 6' 1" tall, which leaves him vulnerable to be hit. As Williams attempted to throw a straight left, Martinez stepped forward and delivered a straight left hand to Williams' jaw that sent Williams face-first to the canvas instantly. As soon as Martinez connected with that left hand, Williams was out cold. It was one of the greatest one-punch knockouts in the history of the middleweight division, perhaps in the history of the entire sport. The win puts Martinez in conversations for a potential bout with either Manny Pacquiao or Floyd Mayweather, Jr., possibly at a catch weight. Tonight, Martinez' bout with Williams took place at a catch weight of 158 lbs., two pounds under the middleweight limit. 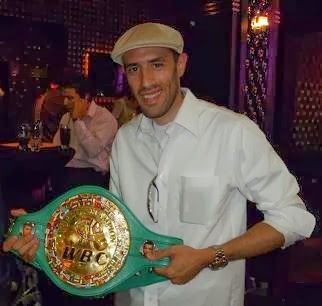 At 35-years-old, Martinez is younger than most 35-year-old fighters simply because he has not engaged in the brutal wars many other fighters have had by that time in their respective careers. In the meantime, Martinez without a doubt is more popular today and will be talked about now as one of the best fighters in the world, although some have already began the discussion prior to tonight's bout. For Williams, he is still a very talented fighter who just got caught with a devastating punch. Yet, there are many reasons why that punch was able to land, and have the impact it did. If Williams is to return and make a significant impact, he must vastly improve his defense, which was a defense that had numerous holes in it prior to the rematch versus Martinez. Many in the media, in addition to countless fight fans, chose to ignore Williams' flaws beforehand when discussing where he ranked among the elite. Fighters can get away with their errors only so long before they encounter a fighter that can capitalize on all their mistakes. Williams met his match tonight. It was quite clear that Martinez studied Williams' tendencies from their first battle, made adjustments and the outcome spoke for itself. Hopefully, Williams can recover some of the momentum he had to salvage a once promising career.